The Italian verb for stretch out is the irregular -ERE verb distendere. ... imagine stretching DIS TENDON out! Distendere can also mean: to spread out (ie tablecloth); to relax, to calm. - distendersi (vr) : to lie down, to stretch (oneself) out; to relax. 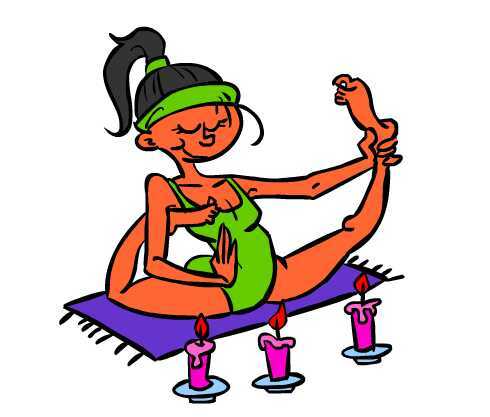 - la distensione (nf) : stretching; relaxation; détente (politics). - distensivo (adj) : relaxing, restful, soothing; conciliatory (politics). Other irregular ERE Verbs with changes in the Passato Remoto and the Past Participle conjugations include : ascendere, apprendere, comprendere, difendere, discendere, estendere, offendere, prendere, rendere, sospendere, spendere. Stretch out and enjoy learning Italian quickly and easily with Memory Triggers, try Cartoon Memory Triggers! To remember a word, just think of the pic! Imagine stretching DIS TENDON out! non distendere (non) distenda! (non) distendiamo! (non) distendete! (non) distendano! ✔ Distendere is an irregular -ERE verb. ✔ Learn distendere and it will reinforce the pattern for other -ERE verbs with the same irregular pattern. ✔ You can more easily remember words and verbs like the Italian for stretch out - distendere using the techniques of the world's Memory Masters. 200 Words a Day! Free Daily Italian Lesson Online - the verb in Italian for stretch out is distendere - fully conjugated. Italian Learning Made Fun and Fast with your free Daily Italian Verb Lesson - distendere.